Institute for Transportation researchers benefit from the state-of-the-art transportation, engineering, and scientific laboratories and other facilities at InTrans, Iowa State University, and the Iowa Department of Transportation. These research and analytical facilities are vital to transportation research in areas such as traffic operations, materials, pavements, structures, soil mechanics, and more. The research facilities available to InTrans investigators help foster synergy and creative ideas leading to new discoveries and technology transfer. The Real-time Analytics of Transportation (REACTOR) data laboratory is a mobility- and safety-focused research facility at InTrans. Researchers continually analyze and interpret operations data to support decision making by the Iowa DOT. 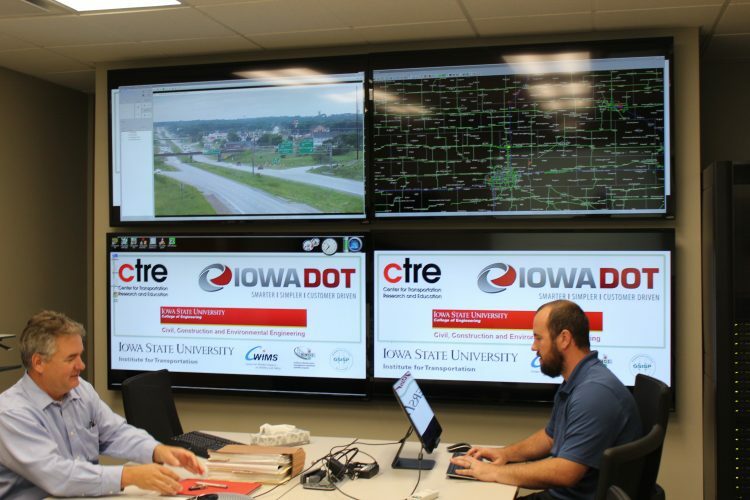 The lab has a direct fiber optic connection to the Iowa DOT’s ITS Network, which provides access for researchers to operations data including sensors, cameras, traffic events, and probe data statewide. The lab features a high-performance computing and machine learning environment, which enables real-time analytics, visualizations, and the development of value-added data streams and performance reporting. The MiniCym Driving Simulator is used to study various driving situations and highway designs without the fear of damage or injury. The MiniCym is contained in a portable trailer that features three LCD screens and a real vehicle seat with a column gear shift and acceleration and brake pedals. The device features real-time driving simulations that allow the “driver” to react and respond to various obstacles and hazards. InTrans’ multimedia training facility is a multipurpose, high-tech room accommodating up to 49 people for meetings, workshops, and other events. Its video broadcasting capabilities enable remote “face-to-face” meetings, and the room can also be used as a computer training lab for people with laptop computers. The room has movable tables for flexible teaching and meeting arrangements, large marker boards, and a large projection screen. InTrans’ Stanley Ring Memorial Library is one of the country’s most well-stocked Local Technical Assistance Program libraries. Supported by Iowa’s LTAP, the library has more than 1,000 publications, 600 videos, and interactive training programs. The library catalog is online and searchable. The library’s mission is to share information about the latest transportation-related technology with local transportation professionals. The Advanced Asphalt Materials Laboratory contains equipment to test and develop Superpave, (superior performing asphalt pavements), a process for designing and analyzing performance-based mixes. The lab was equipped through donations from the Asphalt Paving Association of Iowa and support from asphalt contractors and suppliers. The Center for Nondestructive Evaluation uses advanced measurement techniques to evaluate the integrity and reliability of materials and structures without harming their future usefulness. Since 1985, the center has provided cost-effective tools and solutions to address relevant problems for industrial sectors including transportation and infrastructure. The center was established as an NSF Industry/University Cooperative Research Center. The Environmental Engineering Research Lab provides chemical analysis and related training and consultation services in support of research. Documented quality control receives top priority and is made available to researchers wishing to verify results. The laboratory is equipped for most types of wet chemical analysis, including related spectrophotometric and potentiometric methods. Membrane filter techniques are used for bacterial testing. The Joseph C. and Elizabeth A. Anderlik Teaching Laboratory exposes students to current analytical methods for solving environmental problems and features specialized equipment to analyze air, water, and wastewater. The Livesay Structural Materials Testing Facility features state-of-the-art analytical equipment. The facility has a 400,000-pound-capacity universal testing machine for applying tension and compression loading, and an MTS 110,000-pound-capacity materials fatigue machine used for dynamic and cyclic load testing. The Portland Cement Concrete (PCC) Pavement and Materials Research Laboratory is funded in part by the Iowa Concrete Paving Association. Students use the lab to study and conduct research related to PCC pavements, and the lab supports Iowa’s national leadership role in PCC pavement research innovations. 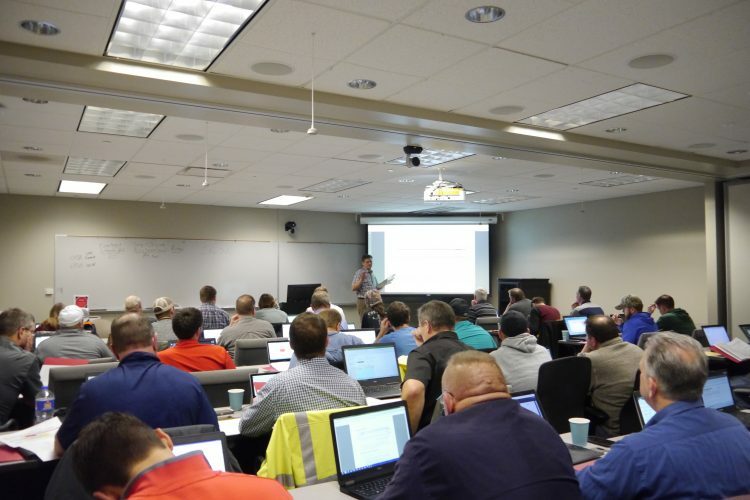 This PCC Lab also is a key component of the research, education, and industry relations activities of ISU’s National Concrete Pavement Technology Center. 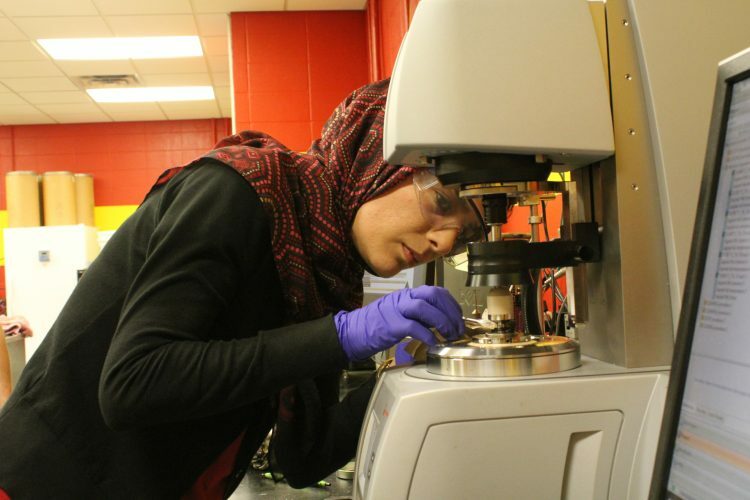 Researchers focus on issues in chemistry, processing microstructure, mechanical property, and durability of PCC materials. Researchers at the Structural Engineering Research Laboratory test bridge loads and study innovative methods for making structures safer and more cost-efficient. The lab has a 4,000-square-foot main testing area, 2,000-square-foot tie-down floor with a one million-pound capacity, 20-ton overhead crane, and electronic and computer equipment for controlling experiments and data logging. Faculty and student researchers use the Wallace W. and Julia B. Sanders Structural Lab for several types of structural studies. The lab includes a 1,920-square-foot reaction floor with 300,000-pound capacity loading points on a three-foot grid. A 15-ton overhead crane accommodates placement of tall loads. The Geotechnical Mobile Lab is helping researchers conduct geotechnical engineering-related projects. The mobile lab is a 44-foot, all aluminum insulated trailer with three climate-controlled rooms and several types of laboratory and field equipment. Researchers use the lab to improve earthwork projects and geotechnical engineering research in several ways, including better understanding the engineering properties of soils, improving earthwork construction quality and efficiency, developing improved testing technologies, and providing field training opportunities for contractors and public agency staff. The Materials Laboratory at the Iowa Department of Transportation provides equipment and expertise for performing materials quality verification and specification compliance and pavement performance testing. The Iowa DOT Library staff collect, curate, and distribute transportation-related research and information. The Iowa DOT Library serves in research gathering, literature searches, database access, and serial access to propose and complete transportation research and construction projects. InTrans and other ISU faculty, staff, and students are among those who use the library’s services.